Summary: Themes related to humanity’s relationship to nature as technological change led to the Industrial Revolution are evident in early modern German and Austrian art and literature. 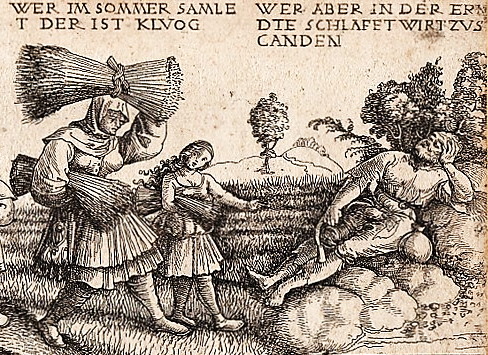 Authors of popular Hausväterliteratur (house fathers’ literature) associated with the Protestant Reformation advocated the rudiments of agricultural “improvement” through division and specialization of agrarian labor, plant selection, crop rotation, and other changes that upper class landowners adopted for their own economic benefit. By the nineteenth century, authors of Volksliteratur and Dorfgeschichten(village stories) composed novels and short stories celebrating aspects of rural culture and land stewardship as both values were increasingly threatened by modernity. In his writings on Die Gute Gesellschaft (The Good Society), Peter Rosegger cautioned against preoccupation with technical progress that was contributing to rural depopulation and erosion of the sustaining Volksgeist (folk spririt) of locale, community, and obligation. Резюме (Рихард Д. Шойерман и Артур Д. К. Эллис: «Отцы семейств» и «Люди поля» в искусстве и народной литературе со времен Реформации): Темы, которые занимаются отношением людей к природе и технологическим преобразованием в контексте промышленной революции, являются очевидными в немецком и австрийском искусстве и литературе начала нового времени. Авторы популярной литературы об отцах семейств, которые ассоциировались с протестантской Реформацией, отстаивали «улучшения» основ ведения сельского хозяйства за счет деления и специализации аграрной работы, отбора растений, севооборота и других культур, которые землевладельцы высших классов использовали только для своей экономической выгоды. До 19-го века авторы народной литературы и деревенских историй писали романы и короткие рассказы и тем самым восхваляли ценности сельской культуры и хозяйства в то время, когда этим ценностям угрожало Новое время. В своем труде «Хорошое общество» Петер Розеггер предостерегал от технического прогресса, которые способствовал уничтожению сельского населения размыванию народного духа в отношении местной и общественно-социальной ответственности. Zusammenfassung (Richard D. Scheuerman & Arthur K. Ellis: “Hausväter” und “Menschen des Feldes” in der Kunst und Volksliteratur seit der Reformation): Themen, die sich mit menschlichen Beziehungen zur Natur und technologischen Wandel im Kontext der Industriellen Revolution beschäftigen, sind evident in der früh-modernen deutschen und österreichischen Kunst und Literatur. Autoren der populären Hausväterliteratur, die mit der Protestantischen Reformation assoziiert wurden, befürworteten die „Verbesserung“ der Grundlagen der Landwirtschaft durch Teilung und Spezialisierung der Agrararbeit, Pflanzenauswahl, wechselnde Fruchtfolge und weitere Veränderungen, die die Gutsbesitzer der oberen Klasse nur für ihren eigenen wirtschaftlichen Nutzen vornahmen. Bis zum 19. Jahrhundert haben Verfasser von Volksliteratur and Dorfgeschichten Romane und Kurzgeschichten geschrieben und damit die Werte der ländlichen Kultur und Wirtschaft gepriesen, in einer Zeit, als diese Werte zunehmend durch die Moderne bedroht wurden. In seinem Werk “Die Gute Gesellschaft” warnte Peter Rosegger vor einem technischen Fortschritt, der zur ländlichen Entvölkerung und einer Erosion des Volksgeistes hinsichtlich lokaler und gemeinschaftlich-sozialer Verantwortung beiträgt. With your own fields, earth’s elementary law! Creep on your carefree lives. And rends the simple unity of life. The measured pomp of social forms betray. The haughty CITY, with its thousand towers! Wernher der Gärtenaere’s epic poem Meier Helmbrecht (c. 1250) is remarkable for being among the earliest German literary works based on a contemporary and personal theme, and for its realistic portrayal of a farm family’s generational drama. The father, Helmbrecht and his eponymous son confront the challenges of life in the waning era of knights and chivalry, and the younger Helmbrecht’s lust for adventure leads to destructive ends in spite of his devoted father’s wise counsel. The boy’s fate is more tragic than the biblical Prodigal Son, but the story, which is set in the Bavarian-Austrian borderland, offers enriching insights into the lifeways of German farmers during the High Middle Ages. They eat up more than is their share. I certainly will plow no more! When I took the ladies’ hands in dance. As with the similar genre in France, German Hausväterliteratur (“House-Father Literature”) emerged as a popular if more Protestant moralized style about rural living in the seventeenth and eighteenth centuries. Books featured informative entries on topics like crop production, raising livestock, bee-keeping, and the household economy. Many Hausväter authors were Protestant clergy whose ideas had been influenced by Martin Luther’s extraordinary German language translation of the Bible and Reformation teachings on “House Father” responsibilities as husband, parent, and manager of household and farm. Luther’s idea contributed significantly to the emergence of the Protestant work ethic that upheld work as honorable means to make yourself or find yourself. 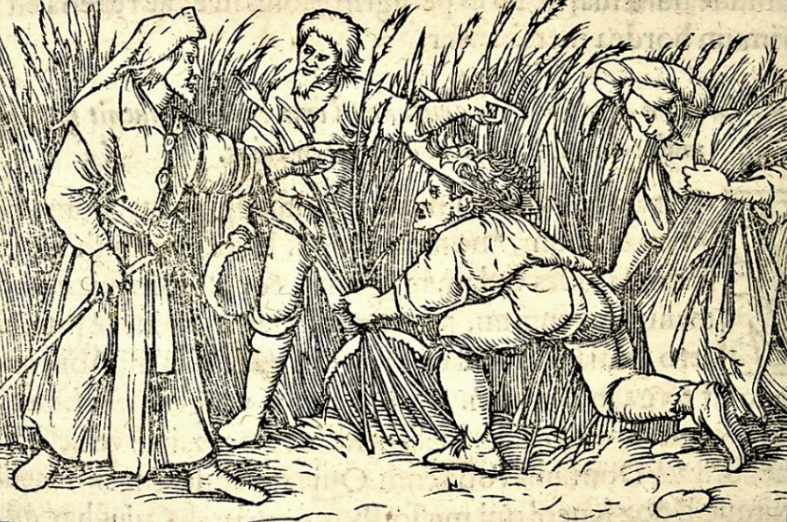 Image 1: Daniel Hopfer: Proverbs 10:4-7, Illustration (detail, 1534); (Verse 5: “He who gathers in summer is a prudent son, but he who sleeps in harvest is a son who brings shame.”) Woodcut on paper, 8 ¼ x 11 ⅕ inches; Wikimedia Commons. Martin Luther (1483-1546) had often mentioned that he was “a farmer’s son,” and his Bible commentaries contain much agrarian imagery. In his discussion of John 6:27, for example, in which Jesus speaks with the disciples about their need for bread, Luther refers to Christ as Owner of the Granary, Baker, Brewer, and Supply; and he encourages prayer and the public reading of the Gospels in the fields to “purify the air” and that “fruit may grow vigorously.” (Luther, 1969, pp. 14-15, 90-91) The complete Lutherbibel was first published in Wittenberg in 1534 and because of the newly invented printed press copies were widely disseminated Reformation thought. Indeed, fully a third of all books printed in German during the first half of the sixteenth century were works by the reformer. Luther had high interest in using artful illumination to facilitate understanding of vernacular biblical texts, and had known the Elector of Saxony’s court painter and engraver, Lucas Cranach the Elder (c. 1472-1553), since 1504 as both men had been in Duke Frederick III’s circle of patronage. German artist and printmaker Hans Holbein (c. 1497-1543) also provided woodcut illustrations for early editions of the Lutherbibel as well as commissioned works for Sir Thomas Moore in England and European papal princes. While his ambiguous religious convictions changed over time, Holbein is generally associated with the reformist movement and his art is considered among the supreme examples from the German reformation. As seen in his rendering of Ruth and Boaz for a Vulgate edition of the Bible (c. 1525), Holbein’s art represents a unique aesthetic in the transition from Gothic formalism to the refreshing realism in illustrations and portraiture. German printmaking is also notable for the popular “perspective” (vue d’optique) panoramas by Georg Balthasar Probst (1732-1801) and others artists affiliated in the eighteenth century with Augsburg printers that simulated three-dimensional views of Bible and historical and city scenes (Schmidt, 1977, p. 17-19, 487). Works like the Florinus’s widely read Oeconomus Prudens (1702)were beautifully illustrated with technical drawings and engravings of threshing scenes and other field labors. One of Germany’s most acclaimed engravers and lithographers of country scenes was Johann M. Mettenleiter (1765-1853), a native of Baden-Württemberg whose early work included illustrations for Franz Marius Babo’s Paintings from the Life of the People (1784) and Lorenz von Westenrieder’s History of Bavaria (1786). Mettenleiter became a founding member of the Munich Kunstverein where he improved lithographic processes of the time which led the wider distribution of his workmanship and noble patronage. In 1790 Elector Karl Theodor of Bavaria appointed Mettenleiter as his court engraver, and Russian Tsar Alexander I subsequently commissioned him to complete a series of engravings of his country estates in St. Petersburg and awarded him the Imperial Order of St. Stanislas. Mettenleiter’s distinctive compositions that depict both country labor and aristocratic life are evident in his 1788 woodcut, Lords and Reapers Celebrate Harvest. 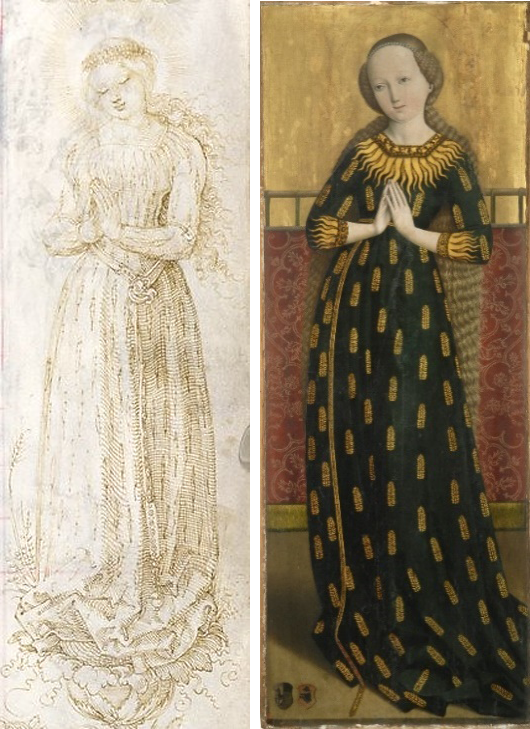 Image 3: (Left) Albrecht Dürer: “Mary in [Grain] Ear Dress” (c. 1515). Randzeichnungen zum Gebetbuche des Kaisers Maximilian I (München, 1907); (Right) Maria im Ährenkleid (c. 1490), Bayerisches Nationalmuseum, Salzburg. One of the Enlightenment era’s most substantial and lavishly illustrated works on religion and natural science was Swiss academician Johannes Jacob Scheuchzer’s four-volume Physica Sacra, oder Geheiligte Natur-Wissenschaft derer in Heil (Physica Sacra, or the Sacred Nature of Science and Salvation). Published in four volumes from 1731 to 1735 in Augsburg and Ulm in separate German, Latin, and French editions, Scheuchzer’s masterwork was popularly known as the “Copper Bible” (Kupfer-Bibel) for some 760 full-page copper-plate illustrations. For this work he commissioned such notable German Baroque engravers as Jacob Fridrich (1684-1751), Johann Pintz (1697-1767), and Martin Tyroff (1704-1759). 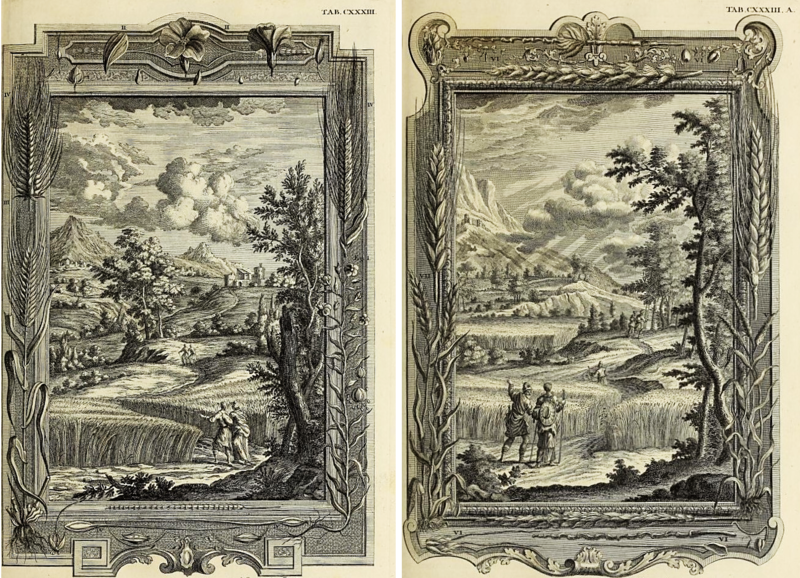 Selected landscape views and other illustrations in some editions were beautifully hand-colored. Scheuchzer was a professor of mathematics and physics in Zürich, and is considered the founder of paleontology for his pioneering field studies in the Swiss Alps and southern Germany. He intended Physica Sacra to popularize unfolding scientific discoveries that he believed shed light on Bible history and meaning for both Catholics and Protestants, and also to defend the faith from natural philosopher skeptics. Image 4: J. Fredrich: Flax and Barley (Exodus 9: 31); M. Tyroff, Emmer and Wheat (Exodus 9:32). Copper-plated engravings on paper, 10 ¼ x 16 inches; Johann Scheuchzer, Physica Sacra (1731-1735). Agrarian associations with German Enlightenment thought is also evident in the writings of Augsburg’s Gottlieb Tobias Wilhelm (1758-1811) and poet and pedagogue Christian Felix Weisse (1726-1804) of Leipzig. Wilhelm was a Protestant pastor and natural philosopher who contributed nineteen of twenty-five volumes in the magisterial Discourses in Natural History published from the 1790s to 1810 by his father, Christian Art Wilhelm, with hundreds of hand-colored copperplate engravings by Jacob Xaver Schmutzer (1713-1775) and Balthasar Friedrich Leizelt (1855-1812). Wesse tutored children of the nobility and edited the influential journal Bibliothek der schönen Wissenschaften und der freyen Künste (Library of the Beautiful Sciences and Liberal Arts) for three decades beginning in 1759. Weisse criticized extravagance in literature and became a popular children’s author of stories that blended religious piety with regional folklore, and published a pedagogical weekly, Der Kinderfreund (The Children’s Friend), the first periodical for children in German. As in his poem “After the Harvest” (“Nach der Ernte”), many of Weisse’s stories and poems served to impart young and old alike with appreciation for country life throughout Saxony. That bows the head as though to greet. 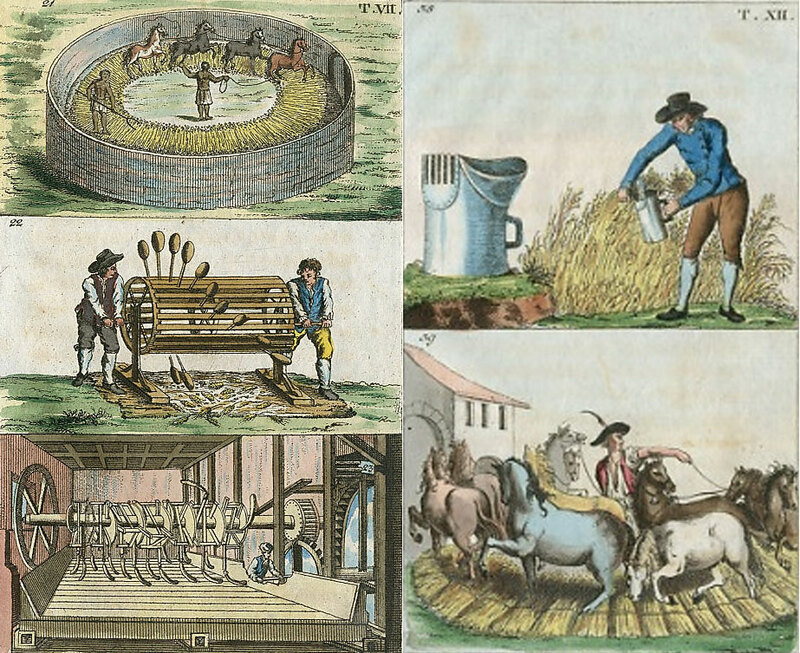 Image 5: Attributed to Jacob Xaver Schmutzer, “Methods of Threshing and Flailing Grain”; Hand-colored engravings, 3 ¾ x 6 ½ inches; Gottlieb Tobias Wilhelm: Unterhaltungen aus der Naturgeschichte (Augsburg, 1810). Gotthelf’s Uli der Knecht (Ulrich the Farm Servant, 1841), translated into English by John Ruskin, is the story of a poor farmer who struggles to learn newer methods of cultivation to transform his meagre holdings into a thriving enterprise. He seasonally hires out to more prosperous Bernese neighbors to sharpen scythes and tend livestock. He partakes of harvest feasting where, “Even the most callous [landowners] feel some sentiment of thankfulness towards God, and understand that they owe Him some offering as an expression of their gratitude. …Should not habitual thanksgiving be the result of so much bounty?” (Ruskin, 1907, p. 452) Reuter, who was jailed as a young man for political activism, wrote the three-volume novel Ut mine Stromid (1862-1864), published in English as Seedtime and Harvest (1872) and From My Farming Days (1878), which describes with hints of Dickens-like caricature the peasant farmers and villagers of his native Mecklenburg. In cutting grain, the reaper must lay the swath behind him, so as to have nothing before him but the blades still standing. So with the deeds that we have done. They must be out of sight, so that all our attention may be turned to what yet remains to do. When in the distance I see mowers bowing and rising so regularly, it seems as if they were going through some ceremonious ritual of prayer. The weeds in the grain-fields are no man’s property until the poor take them away and convert them into nutritious food. Do you ask, of what use are weeds? Perhaps many other things should be judged by the same rule. Before him the brown fields stretch away, the larks blow their trumpets, and in tender, reddish blades the dead arise and look up to heaven. Then gradually everything begins to grown green, the tiny leaves curl and bend earthwards again as if they are listening for any counsels about life that the Mother may give to them. Then they aspire upwards, rolling themselves into sheaths, out of which, little by little, emerges the stalk and the inmost being of the grain. … And the single blade is now in its full glory. The four-sided ear, in which the still tender grains lie scale-like over each other, hangs its blossom out like tiny flags wherever a grainlet lies in its cradle, which flutter and tremble without ceasing, while the high stalk rocks thoughtfully to and fro. The 1815 Congress of Vienna had brought peace to a rising European middle class long weary of Napoleonic devastation. Latent desire for domestic tranquility following so many years of foreign interventions restored the vitality of regional cultures and led to renewed appreciation for contentment through the simple life. The martial grandeur evident in public events and fine art of galleries in Berlin, Mainz, and Vienna gave way to a half-century of introspection during which many artists and designers found meaning in more sentimental expressions of community Gemütlich and personal piety. Biedermeier furniture designers used locally available cherry, ash, and oak instead of the imported mahogany formerly preferred by homeowners to construct unique designs featuring straight lines and panels often colorfully decorated with unpretentious designs inspired by peasant folk art. 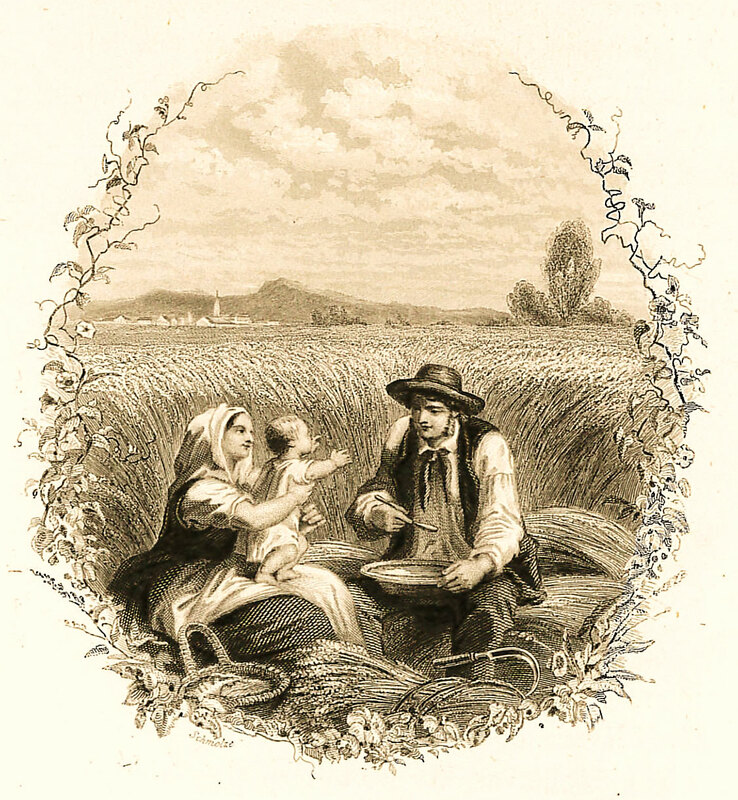 Image 6: After Ferdinand Waldemüller: The Harvest (1847). Lithograph on paper, 7 ½ x 9 inches (1887). Palouse Regional Studies Collection. Each is now a king. By the mid-nineteenth century, patrons of the arts in Germany experienced a range of aesthetic styles variously influenced by regional responses to Romanticism and Biedermeier as well as by foreign trends. Berlin, Düsseldorf, Frankfurt, a. M., Munich, and other major German cities hosted academies that became generally known for interpretations of nature and society through new approaches to subject, color, and composition. Jakob Becker (1810-1872) studied at the Düsseldorf Academy from 1833 to 1841 where he mastered the finely detailed if fanciful landscapes and genre subjects for which the school became known and which significantly influenced many prominent American Hudson River painters. Following his studies in Düsseldorf, Becker began his three-decade tenure as the first professor landscape and genre painting at the Städel in Frankfurt, and sought out rural subjects in order to depict with both realism and emotion the social conditions of the peasantry. Among his most famous works are the harvest and family-themed paintings Reapers Fleeing a Thunderstorm (1840), which shows workers’ responses to the fearsome prospect of a grainfield fire, and joyous Homecoming of the Reapers (1847). Munich native Karl Theodor Piloty (1826-1886) painted grand scenes from German history and inaugurated a generation of realist artists following his appointment in 1856 as professor at the influential Munich Art Academy. One of his most notable protégées, Theodor Schütz (1830-1900, sometimes “Schultz”) studied at the school from 1857 to 1863 and frequently painted central German and Italian country scenes while traveling with Piloty and other academy artists. Schütz’s brilliantly colored, naturalistic canvases like Midday Prayer in the Harvest (1861) and Evening Landscape in Harvest (1879) depict some of the era’s most evocative scenes of German country life. The Munich Academy also influenced William Merritt Chase, Walter Shirlaw, and other American artists who studied under the tutelage of Piloty, Karl Otto, and others prominent German artists. One of Piloty’s and Schütz’s most notable students, Albert Kappis (1836-1914), was a prodigious painter and printmaker from Stuttgart who favored genre themes and rural landscapes that included numerous harvest and haying scenes. Kappis traveled to Barbizon in 1867 and many of his subsequent works anticipate Impressionism through use of a Swabian earth tone palette to depict scenes of peasant labor in such paintings as Harvesting (1871), Harvest Time (1871), Stuttgart Harvest (1878), and Children at a Harvest Festival (n.d.). Artistic fidelity to Volksgeist agrarian and religious values is also seen in the work of such regionalist painters of the time as Hans Thoma (1839-1924), and though trained at prestigious art academies in Düsseldorf and Karlsruhe, where he later taught, his heart and imagination never strayed far from the Black Forest settings of his youth. The prolific Thoma credited the sixteenth century influence of Lucas Cranach the Elder more that the modern masters with whom he studied. His many robust biblical scenes and naturalistic poetic of Baden-Württemberg and Hessen were prized by galleries and collectors throughout Europe. Thoma’s colorfully placid depictions of harvest time labors, often amidst intricately painted foliage of trees and forbs, include Ripened Grain, Summer in the Black Forest (1873), Grainfield in Ears (1883), and Grainfield by Oberusel (1902). Pittsburg’s Charles Stanley Reinhart (1844-1896) studied in Munich and Paris in the 1880s and returned home to become a leading figure in America’s Golden Age of Illustration. Willa Cather (Lincoln Courier, October 23, 1897) wrote that Reinhart depicted “the dignity and tragedy of labor” in the many scenes he supplied to illustrate Harper & Brothers publications and novels by European authors. One can sense the heat, exhaustion, and noise in his spirited scene, Primitive Thrashing, which shows a man straining with a taut rope to guide a team of horses around in a circle as they pull a threshing sled weighed down by a woman who holds on dearly to a wooden brace for support and balance. 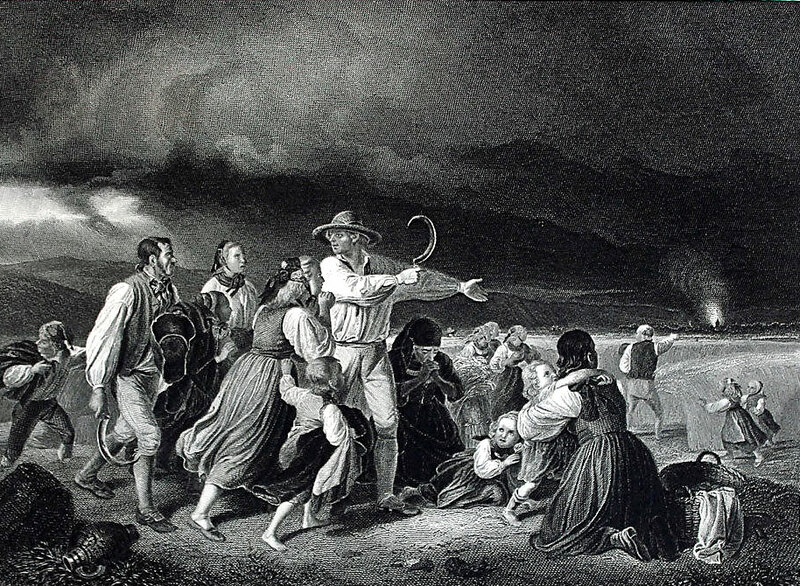 Image 7: After Jakob Becker: Reapers Fleeing a Thunderstorm (1840). Engraving on paper, 5 x 7 inches (1860); Palouse Regional Studies Collection. Dresden emerged as an important center for German Expressionist art with the formation in 1905 of the Die Brücke (The Bridge) Group by Fritz Bleyl (1880-1976), Eric Heckel (1883-1966), and several others who had no formal training in art but valued intuition and fresh perspectives to interpret a changing world. These bohemian artists sought to assert the inspired printmaking and painting styles of Dürer and Lucas Cranach the Elder and appropriate new ways of depicting meaning in the spirit of Van Gogh and Kandinsky without the constraints of academic conventions. Similar movements soon arose in Munich, Berlin, and other German cities where writers and artists sought to express their perceptions of troubling social and political trends that contributed to a sense of alienation from the natural world and preoccupation with material values. 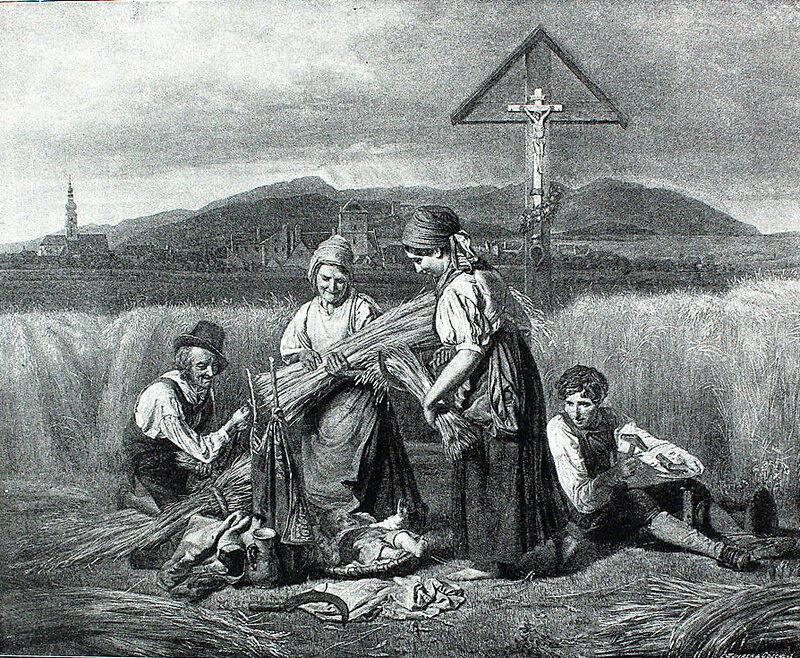 Image 9: Karl Hermann Schmolze: Harvest Nooning (c. 1855). Palouse Regional Studies Collection. The Reformation, following on the Renaissance, takes its place as one of the great disruptive innovations in European and world history. The radical, world-changing work of such giants as Luther and Melanchthon was made possible because of advances in the arts, sciences, and technology, among them the printing press which made possible individual access to both salvation (religion) and literacy (education). Other technologies followed on, changing the shape of things to come from predominantly agrarian and pastoral to industrial and urban. In this essay we have attempted to capture an image of something largely lost, the hallowed harvest. Auerbach, Berthold (1869): Black Forest Village Stories. New York: Leypoldt & Holt. Bell, Clair Hayden (1931): Peasant Life in Old German Epics: Meier Helmbrecht and Der Arme Heinrich. New York: Columbia University Press. Dow, James R. & Sandrock, James S. (1976): Peter Rosegger’s ‘Erdsegen’: The Function of Folklore in the Work of an Austrian Heimatdichter. In: Journal of the Folklore Institute, vol 13, Nr. 3, Special Issue, pp. 227-239. Dulcan, Henry William (1856): The Book of German Songs. London. Etheridge, Samuel N. (Ed.) (2014): Poetry for a Lifetime. Orinda: Miravista Press. Luther, Martin (1969): Luther’s Works, Vol. 42. St. Louis: Concordia Publishing House. Reed, John (1997): The Schubert Song Companion. New York: Manchester University Press. Schiller, Friedrich (1887): Schiller’s Poems and Ballads. London: George Routledge and Sons. Schmidt, Julian (1865): Geschichte der Deutschen Litteratur seit Lessings Tod. Leipzig: F. W. Grimow. Schmidt, Phillip (1977): Die Illustration der Lutherbibel, 1522-1700. Basel: Friedrich Reinhardt Verlag. Taylor, Bayard (1864 / 1871): Byways of Europe. New York: G. P. Putnam and Son. 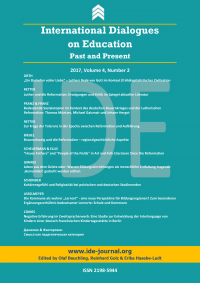 Van Berkel, Klaas & Vanderjagt, Arjo (Eds.) (2006): The Book of Nature in Early Modern and Modern History. Leuven: Peeters, Bondgenotenlaan. Prof. Dr. Richard D. Scheuerman: Associate Professor of Curriculum and Instruction, Seattle Pacific University, Seattle, WA (USA). Contact: scheur@spu. Prof. Dr. Arthur K. Ellis: Professor of Education, Director of the Center for Global Curriculum Studies, Seattle Pacific University, Seattle, WA (USA). Contact: aellis@spu.edu. i Cranach’s woodcuts were reworked in later editions of the Lutherbibel by other prominent German artists including Christoph Murer (1558-1614), and Paul Creutzberger (1539-1591). Other fifteenth century portrayals of Maria im Ährenkleid are in the Bavarian National Museum, Munich; State Pushkin Museum, Moscow, and St. Mary’s Church, Budweis, Czech Republic. 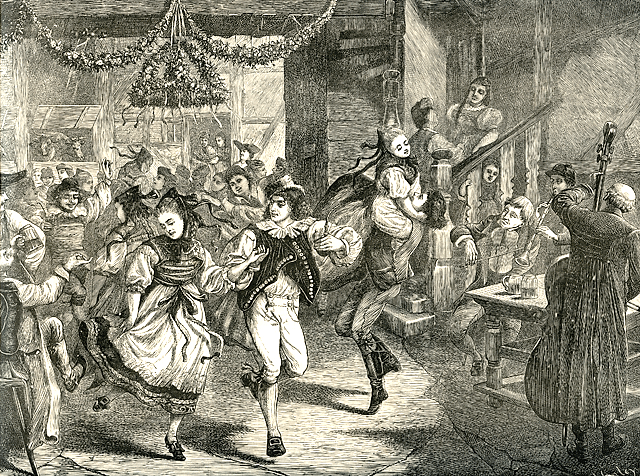 Luther also sought to refocus spiritual attention to obligations that had become increasingly secularized and decried, for example, the “disgraceful babble and hilarity” of village processions and raucous outdoor festivals that took place during Rogation Week. Observed since at least the sixth century, Rogate Sunday was to begin a time of fasting and abstinence in anticipation of Ascension Sunday in April or May, and was associated with the annual “Blessing of the Fields” ceremonies which signaled the beginning of springtime planting. iii A gittern is a small guitar-like instrument. iv In his later years Mühling became a prominent figure in the Düsseldorf Successionist movement. Notable German scientists of the time also contributed to documentary botanical art featuring cereal grains. Among the most notable publications that contains hundreds of color lithographs is Flora von Deutschland, Österriech und der Schweiz (1885), the ambitious four-volume work by Otto Wilhelm Thomé (1840-1925) of Cologne. v Marc’s Sheaves of Grain (Getreidegarben) is in the collection of Iowa City’s University of Iowa Museum of Arts which also contains Expressionistic works by Gabrielle Münter and Wassily Kandinsky.